What's better than a traditional baby shower? A shower for the future Jedi, light saber wielding baby, of course! 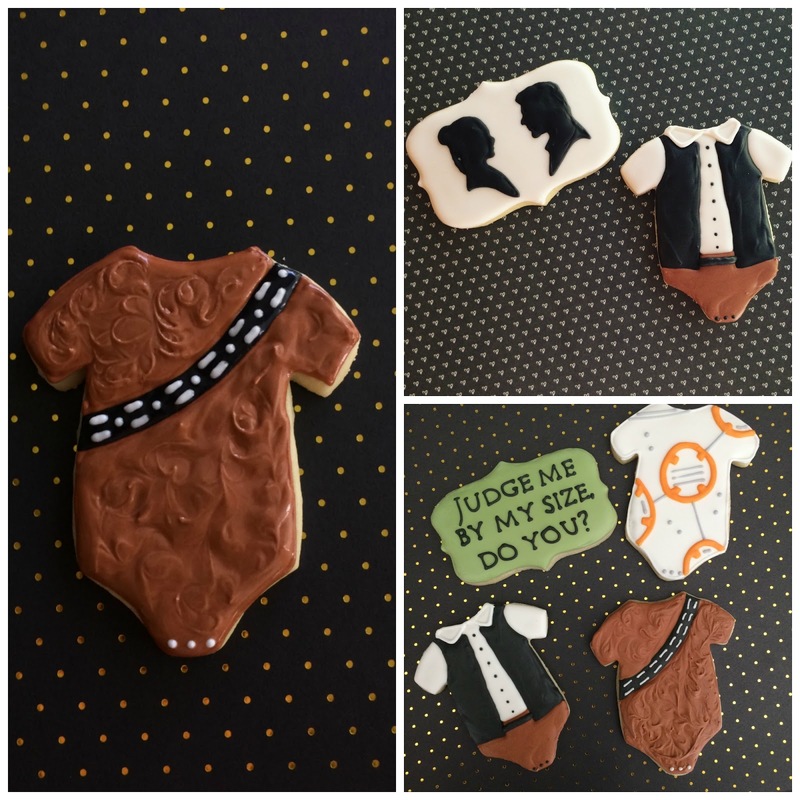 I was so excited when my best friend asked if I could create Star Wars themed baby shower cookies. Karen of Desert Chica has created an amazing themed baby shower blog post full of easy and fun ideas for you! Come check out her BB-8 Diaper Cake, Jedi baby shower banner and more! Baby onesies for everyone! Come to the dark side or become a Jedi, we have delicious cookies for all. I have been designing a sweet Princess Leia one, too. Can't you just picture a wee Yoda? These are so easy and were fun to design. Do you want to learn how to create a Star Wars onesie cookie? Of course you do! Let's create the baby Chewbaca together. I can just see hear his little growl now. Do you need an awesome royal icing recipe? Click here and read up on the one I use! You will love it; let me know if you have any questions on creating it. 1. Pipe Chewbaca's black amo band across his chest. 2. Pipe two rows of white bullets on the amo band; you can wait till the band sets or place while wet. 3. Outline and squirt the thick brown icing in the top part of the onesie. It is not intended to flow down, so this is a great cookie idea if you are still getting used to icing consistency. Using a toothpick or cookie scribe, swirl the brown icing around to mimic the look of Chewbaca's soft fur. Repeat on the lower part of the onesie: outline, squirt and feather it around. 4. Pipe 3 small snaps at the bottom of the onesie and you are done! Can you believe it? So easy and so fun!! Like my bibs? So fun and easy! Perfect for the Star Wars lover in your life. I hope my tutorial was easy for you. If you have questions, please let me know. Looking for more Star Wars themed cookies? These are just adorable cookie designs. A traditional baby shower is my most favorite thing and these cookies complement the traditional theme perfectly. For my cousin I recently threw a chic baby shower at one of the indoor event venue Atlanta and everything was brilliant in that bash.